New report says terrorists are attaching lights, toys, to incendiary balloons in attempts to lure preschoolers into playing with them. 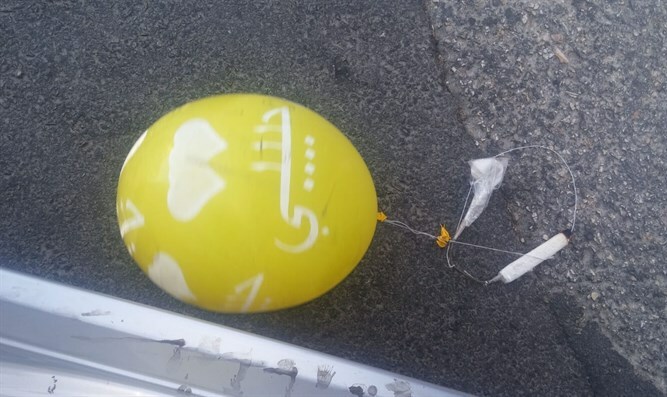 A new attempt by Hamas to entice Israeli children to play with incendiary balloons includes choosing colorful balloons and attaching lights and toys to them, Yediot Ahronot reported. According to the report, a cluster of balloons recently found in the Eshkol Region was attached to an explosive toy. The balloons, found late at night, were colorful and included colorful flashing lights. Kibbutz Be'eri's secretary, Yaniv Hagi, told Yediot Aharonot: "Incendiary balloons land in our kibbutz at all hours of day and night. They arrive with flashing and sparkling lights, and some of the balloons have smiley faces on them, so that children will want to touch them." "I expect the Prime Minister to take responsibility and say, 'I'm going to do everything necessary to solve this issue.' That doesn't mean just force, it also means talking, working, trying, investing resources, time, and money - everything he can. This situation cannot continue." The newspaper also quoted new safety guidelines, asking parents to "tell children not to touch objects which are attached to balloons and look like toys. In such a case, distance yourself [from the object] and call an adult or a security officer." "Sometimes there are pictures on the balloons, with hearts and smiles, and funny faces and other things. All of these are intended to create the impression that the object is safe. Do not touch these, and do not go near them."